The Who took an eternity to get around to releasing this their eleventh album. The differences between the 'first' farewell tour in 1982 and the new-look Who were many, as the band who'd hoped they'd die before they got old sang about old age for the first time, on an album that's dominated by themes of love and loss. 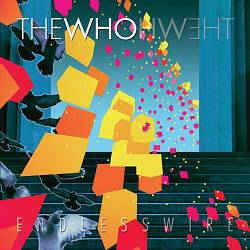 This is a slower, more reflective Who than the last time around, with the band's firepower reduced by the loss of Keith Moon, the absence of Kenney Jones (not invited back past 1982, mainly on Daltrey's insistence) and the unexpected death of John Entwistle in 2002, just as The Who's big return was first mooted. Some bands would've ignored the line-up changes and just carried on, but instead of trying to recreate the impossible, The Who embrace the changes with a (largely) slower, quieter, and humbler type of an album (at least until Keith Moon's godson Zak Starkey arrives on the mini-opera - they never did quite find a replacement for The Ox, though Pino Palladino does as good a job as anyone could in the circumstances).